David, a singing story teller, is a former New York City cab driver, bartender, bouncer, and actor. His songs have been described as "cinematic." They've been sung by artists as varied as Grammy-winner Shawn Colvin and Dove Award winner Kathy Troccoli, and recorded by producers from Arif Mardin to Rick Wake. Along with Lyle Lovett, Richie Havens, Julie Gold (From a Distance) and others, his early Fast Folk recordings are now part of the permanent collection at the Smithsonian Center for Folklife and Cultural Heritage. 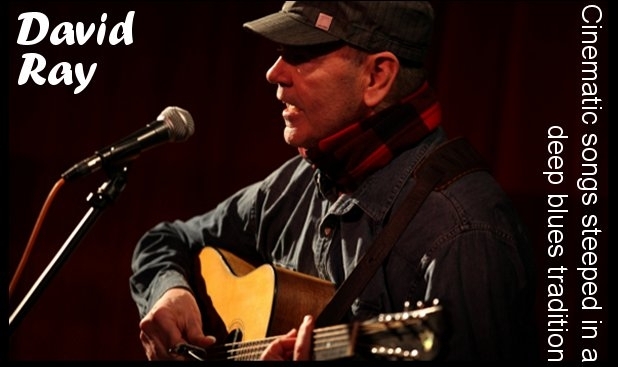 As a performer, heís shared the stage with Roger McGuinn, Shawn Colvin, John Leventhal, Dave Alvin, Lucy Kaplanski, Marshall Crenshaw, Joan Osborne, Cliff Eberhardt, Maia Sharp, Mark Ford, KJ Denhert, Dan Hicks and the Hot Licks, and many more.